Paul B. Jaskot, professor of art history, along with Alexandra Garbarini (Williams College) edited and wrote the introduction for the new publication, Lessons and Legacies XIII. New Approaches to an Integrated History of the Holocaust: Social History, Representation, Theory (2018 Northwestern University Press). A collection of essays representing the forefront of current research on the Holocaust in a range of disciplines, Lessons and Legacies XIII explores the social history of the Holocaust, its representation in postwar culture, and new theoretical approaches. Analyses at the most intimate scale—of the individual or of a particular locale—are juxtaposed with broader studies of the war or postwar order. Complementing these different types of analysis are theoretical investigations of individual agency, moral judgment, and the construction of meaning and memory, with implications for the study of the victims of the Holocaust and our understanding of society as a whole. The thirteen essays in this volume are by an international collection of scholars and mirror the contemporary landscape of Holocaust studies, which includes history as well as film and literary studies, philosophy, cultural studies, and religious studies (among other disciplines). 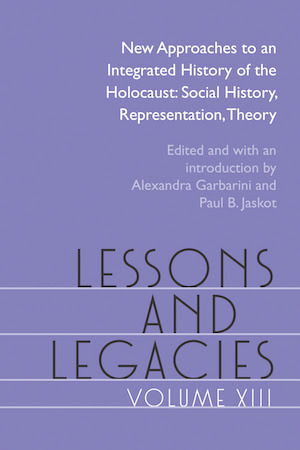 Each of the volume's three sections contributes to understanding the Holocaust and postwar ramifications of the genocide by focusing on: the history of specific communities of both victims and perpetrators; postwar cultural representations; and innovative theoretical understandings of the history and cultural representations. The essays in this volume thus represent new directions in the field that contribute to building integrated histories of the Holocaust.